I got a Liebster Award! Many thanks to blogger, and fellow Sweat Pink Ambassador, Brandi Jeffries at noteworthyrunning.blogspot.com for the nomination. 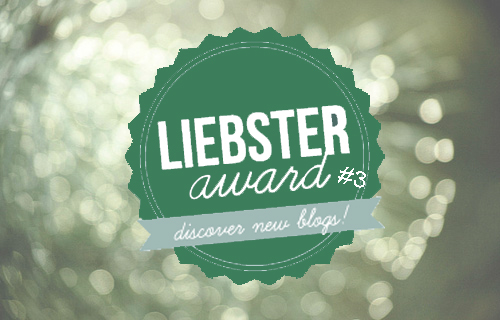 The Liebster Award is awarded to new and upcoming blogs by other bloggers. It is to help the nominated bloggers be introduced to other readers and gain an audience. By receiving this award, the blog receiving it must pay it forward new bloggers as well! The general rule is 10 new blogs and 10 questions, but it seems the Liebster has come almost full circle in the world of blogs I follow, so I only did five nominations and six question. To pay it forward: Please link the nominators blog in your blog about being nominated, answer the 5 questions below the nomination list, and make up some for your nominees! 1. What inspired your fitness journey? I started in the gym with the sole purpose to build some muscle and change the shape of my body. I was tired of being “shapeless” and as horrible as this sounds with all of the people out there battling with being overweight – I was tired of trying everything to gain a few pounds, so I could stop dealing with the snide remarks people would make about my size, and the gym was my last ditch effort to do that. From there, I’ve become inspired by so many people in the fitness industry, that it would take me days to list them all. 2. When do you prefer to workout, morning, noon, night? I prefer to work out first thing in the morning when I can. Unfortunately, my schedule doesn’t always allow it (actually it pretty much never really does anymore), so I grab gym time when I can get there. It’s typically late afternoons and early evenings. 3. What’s your favorite pre-workout meal? I actually don’t really have a pre-workout meal. I make sure that I eat a small meal about an hour and a half before the gym, then while I’m working out, I drink my amino mix, and post workout, I have a protein packed smoothie for recovery. 4. How much planning to you put into your fitness routine? Quite a bit. As a personal trainer, I take pride in my fitness routine. I am my best advertisement after all. At the same time, with that aside, I have goals that I’m always striving for and planning/mapping out my routine needs to be effective in getting me to that goal. 5. What is at the top of your bucket list for fitness? To be the next Jamie Eason. But that’s at the super top of my bucket list and I’ve got a long way to go, and have a lot of work to do to get there. More realistically, I am still on top of that fence post with the idea of competing this fall. I’m just not sure I can pull the trigger on it. 6. What is the greatest thing you have gotten out of fitness? My shoulders? My traps? On a more serious note, first hand experience and knowledge that’s giving me the opportunity to create and pass on tools to others to succeed in their own fitness journeys. (Also the opportunity to stand like, 5-feet from Mike O’Hearn while he was guest posing at the OCB Pine Tree State, that was pretty damn awesome). 7. Do you feel like fitness has change the person you are other than physically? Fitness has definitely changed the person I am. Or at least, it has drawn me out of hiding. I’ve always had the person I am today inside of me, I just needed to find the confidence within to unleash “the beast” so to speak. 8. Do you do other sports? I do! I play co-ed softball and pick up soccer games whenever I can. An indoor turf center is opening this summer and I plan to play soccer on a more regular basis with the co-ed league forming there, and picking up lacrosse again. 9. What is your ultimate fitness goal? To have my own gym, and to snag a spot writing in a health magazine – or bodybuilding.com. 10. What is your number one fitness pet peeve? Off the top of my head, it is always going to be people who don’t re-rack their weights. But ultimately it is people who are inexperienced, haven’t received proper education & training in the gym, with fitness, and/or nutrition — and pass out advice. Or charge for advice. Or “teach” classes. Yes, it’s a mean outlook to have, but there is a reason why people go to school to be trainers and instructors. And nutritionists/dietitians. You wouldn’t want a doctor operating on you who hasn’t been properly taught and had done residencies, would you? All aspects of your health should be entrusted into the hands of well trained professionals. 3. What has been the biggest hurdle you have faced in life? 4. One thing you don’t know how to do, but wish you did? 6. Wisdom you wish you could instill in others?